The general concept of life as a concert artist is that it must be great to swan around the world checking into beautiful hotels and dining out in restaurants – but life is seldom like that! This weekend I spent in Puebla at La Constancia, a marvellous ex-factory which is now a music school, music museum and concert hall – and, most importantly the home of the original Orquesta Sinfónica Esperanza Azteca. I was giving a weekend class for thirty young flute players who are members of Esperanza Azteca. I had a terrific time with these exceptional young people and was sorry when the time came to leave. If I had known what was about to happen, I might even have stayed longer!!! First of all, the taxi which was to pick us up called to say that he would be half an hour late and was that all right? No, it wasn’t! I had a bus to catch back to Mexico City. 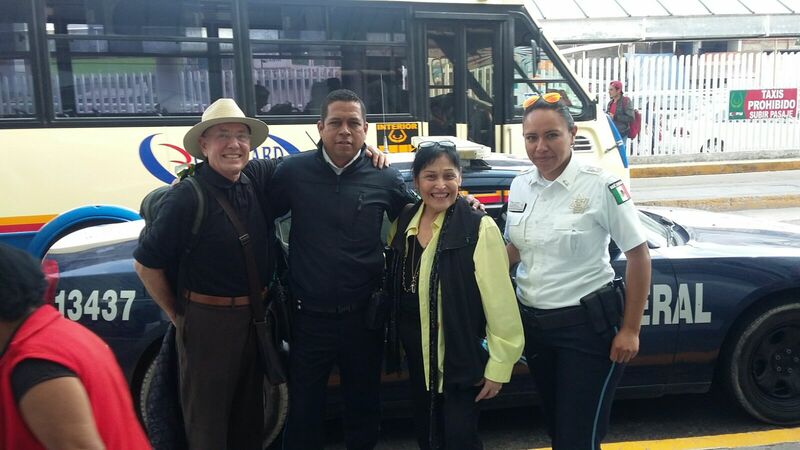 Anyway, we found a passing taxi quite easily and he agreed to take us to CAPU, the Puebla bus station. We piled in with all our luggage and set off. After about a mile or so there were strange noises from the engine but the driver told us not to worry. However, about a mile later and on the motorway the car actually broke down. The driver kept trying to start it with no luck – the only fortunate thing being that he had managed to get onto the side of the road! After a few minutes a police car pulled up behind us and there were a lot of strong words between them and the driver, during which time we made a few futile attempts to flag down passing taxies (which all seemed to be full).The clock was ticking and I was getting quite anxious when one police (a very nice lady!) decided that they better take us to CAPU. Sadly, their trunk was full so Michael and I with all our luggage had to squeeze into the back seat of the police car and we were on our way. The traffic wasn’t too bad – until we approached the bus station where there was a huge queue… The drive joined the queue and his partner (a very bright lady) asked why he didn’t go into the other entry “Because it says that it is restricted entry!” “But you’re a Federal Police officer, you can go anywhere!” she replied so he reversed a little bit and went in the “restricted entry”! And so we arrived at CAPU with the siren blaring with about ten minutes to spare. A big crowd gathered to see what the excitement was and we had just enough time to give our rescuers a big hug and to take a photo with our new “Federales” friends who for us were like knights in shining armour!